All of our polarized 3-D glasses have 45/135 degree LINEAR polarization, and are for most projected 3-D movies and 3-D slide projection, which additionally require a silver screen and polarizing 3-D filters. 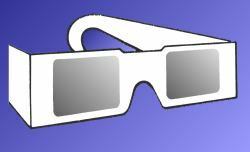 These are not the correct type of 3-D glasses for viewing Red/Cyan 3-D images on the Internet (such as the Nasa/JPL Mars images. Click on Reel 3-D: Anaglyph Glasses for these glasses). These are also not correct for most passive glasses computer monitor displays, such as StereoGraphics' ZScreen, or with many LCD 3-D projector configurations. These systems require CIRCULAR polarized 3-D glasses, which we do not offer. See "Questions and Answers" on this subject at the end of this section. When low cost is the main consideration these offer quality polarizers in cardboard frames. Styles are subject to change without notice. Lightweight rigid plastic frames (temples do not fold) offer a good combination of quality and economy. The best choice when low cost, multiple use, and large quantities are desired. Fit easily over eyeglasses, and good for children, too! Black plastic frames, but color subject to change without notice. Our best polarized 3-D glasses! Thick (.030") plastic lenses and ophthalmic quality black plastic frames, like regular eyeglasses, make these permanent and comfortable. For the serious 3-D enthusiast or 3-D professional. Low cost clip-on polarized 3-D glasses for eyeglass wearers. Does not flip up. Universal clips to fit all eyeglasses. High quality thick plastic polarizers (.030"), about 2.3" x 2.5" size. Deluxe "flip-up" clip-on polarized 3-D glasses for eyeglass wearers. Universal squeeze center spring clip for attaching to eyeglasses, and with the flip-up feature. High quality thick plastic polarizers (.030"), about 2.3" x 2.5" size. Q: When do I need polarized 3-D glasses (light gray lenses) instead of the red/blue (anaglyph) ones? A: Most two-lens 3-D projection systems for both slides & movies use the full-color polarized method. Almost anything printed on a page, or displayed on a computer monitor, with red/blue or red/green color fringing uses anaglyph (red/blue) 3-D glasses. Q: How does polarization work? A: The principle of polarization of light for separation of stereoscopic images was proposed in 1891 by J. Anderton. The polarizing filters have a molecular structure that is like an invisible picket fence, with all of the pickets going in one direction. When a second identical polarizer is crossed at 90° to the first polarizer, the light gray turns a very dark blue or purple, effectively canceling most of the light transmission. If separate right & left images are projected through two polarizers, each at 90° to each other, onto a non-depolarizing silver screen, and then viewed through 3-D glasses which match the projection filters, each eye sees the image intended for it, while the image for the other eye is dark. Your brain does the rest, and converts the separate images into a combined 3-D one. Q: What are the polarization angles of your 3-D glasses? A: At 45° & 135° (which are 90° to each other). This has been the standard since the early 1940's. The material itself is a linear polarizer, 30% transmission, either .010" or .030" thickness, depending on the glasses style. Q: Do I really need a silver screen? A: Yes!!! A white or beaded screen will depolarize the light, and you will see a flat double image - even with 3-D glasses on.